This article is about the DJ. For the arcade and computer game, see Q*bert. Growing up in San Francisco's Excelsior District on Moscow Street, he graduated from Luther Burbank Middle School and in 1987 from Balboa High School. Qbert started playing with records at the age of 15, although he got his first Fisher-Price turntable as a toddler. He was influenced by the street performers and graffiti artists of the local hip hop community in the mid-1980s. It was at Balboa's school cafeteria that he first met Mix Master Mike in a DJ battle; the two have been good friends ever since. Qbert started his musical career in a group called FM20 with Mix Master Mike and DJ Apollo in 1990. In New York City when playing a show, Crazy Legs saw them and invited them to join the Rock Steady Crew. They accepted the offer to join the crew. Going by the name Rock Steady DJs, they then proceeded to take the 1992 Disco Mix Club World DJ Championships (DMC) world title. Qbert was also one of the founding members of the band Invisibl Skratch Piklz. Although there were other turntablist crews before the Invisibl Skratch Piklz, the Skratch Piklz were the first to apply the band concept to turntablism, layering drums, basslines, and scratch solos on top of each other. Qbert, along with other Skratch Piklz, created a series of videos entitled Turntable TV. Now out of print, the first 5 episodes were released on VHS and contained demonstrations, showcases, skits, and other DJ related content. Qbert's solo efforts include 1994's Demolition Pumpkin Squeeze Musik, and 1998's Wave Twisters. The latter album was created mainly with samplers and beat machines versus the turntable, and later turned into an animated feature of the same title. 2001's Wave Twisters movie was somewhat unusual in that the animators and digital artists had to invent images and movements to the pre-recorded music, as opposed to the other way around (Disney's Fantasia was made the same way). More recently, he has worked with Vestax to develop the QFO, an all-in-one scratching instrument. The QFO combines a turntable with a mixer's crossfader. In 2006, he introduced the Qbert turntable cartridge, a model put out by Ortofon. In May, 2009, Qbert launched the Qbert Skratch University, an interactive online learning school and community for DJs through the ArtistWorks website. At the 2016 edition of the DMC World DJ Championships, DJ Q-Bert was awarded with a DMC Legend jacket. In a 2011 interview with the website WeBeVegan.org, Qbert stated that he is a vegan. Qbert's music was featured in the video game Tony Hawk's Underground and he appeared as himself on the Slam City Jam level. He also appeared as himself in DJ Hero 2. ^ Chonin, Neva (1998-11-01). "A Dilly of a Career / The Bay Area's Invisibl Skratch Piklz have become world stars of turntablism". San Francisco Chronicle. Retrieved 2007-04-10. ^ de Leon, Krishtine (2005). "Get on your P's and Q's : Ten Things You Don't Know About QBERT" (PDF). Ruckus - Bay Area Rap Culture: July/August 2005. www.ruckusmag.com. Archived from the original (PDF) on 2007-09-29. Retrieved 2007-04-10. ^ Banjoko, Adisa. "The Trigger Man: Face to Face with Mix Master Mike". Retrieved 2007-04-10. (Mix Master Mike): In a cafeteria lunchroom, at Balboa High School in San Francisco, CA. Then we battled again in Stockton, CA. He won in Stockton. I won at Balboa. ^ "Ortofon OM Q-BERT Cartridge Free Shipping!". Djdeals.com. Archived from the original on 2013-01-22. Retrieved 2012-12-19. 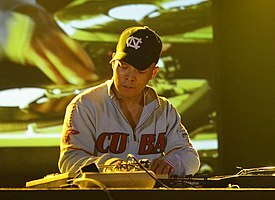 ^ "DJ Qbert: Connecting hip hop with veganism «". Webevegan.org. 2011-11-16. Archived from the original on 2012-04-25. Retrieved 2012-12-19. Wikimedia Commons has media related to DJ Q-bert. This page was last edited on 5 November 2018, at 21:34 (UTC).